I was so excited to be a speaker at the Ubud Literary Festival. All the authors were given a wonderful room in the Tjampuhan Hotel, and I had to practise how to pronounce it for days. The hotel was beautiful with tropical gardens, swimming pools – but – I had to climb 110 steps up to breakfast, and 110 down. Up again to the festival and down again at least three times a day. 660 steps a day for six days kept me very fit! It was great to meet writers from around the world and network ideas. 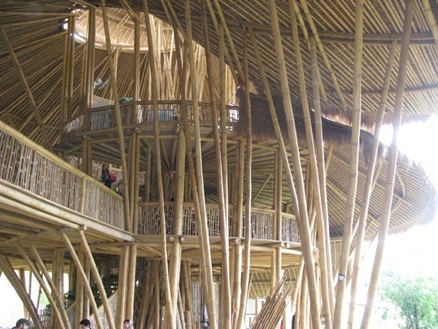 After the festival I was invited to do a presentation at the Green School, a fabulous school made entirely of bamboo. It was amazing. I was asked to speak at their Friday assembly, where the whole school attended and parents were invited as well. 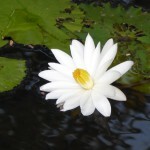 Then two days at the luxurious Maya Ubud Resort where I had a wonderful rest. 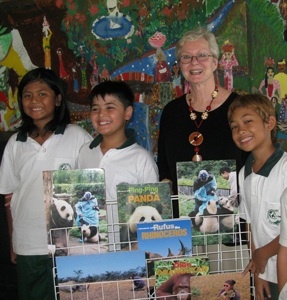 The Dyatmika School in Nusa then asked me to do two presentations. I was in the middle of my second presentation when all the children jumped up and rushed out of the room. “What did I say?” The librarian grabbed my arm and said, “earthquake”. Earthquake? We hurried to higher ground and waited until it was safe to go back. When it was over I finished my presentation. It was an incredible experience.